Once again tax law is elasticated to aid, abet and reward tax dodging as General Anti-Abuse Rule is busted to Corporal. 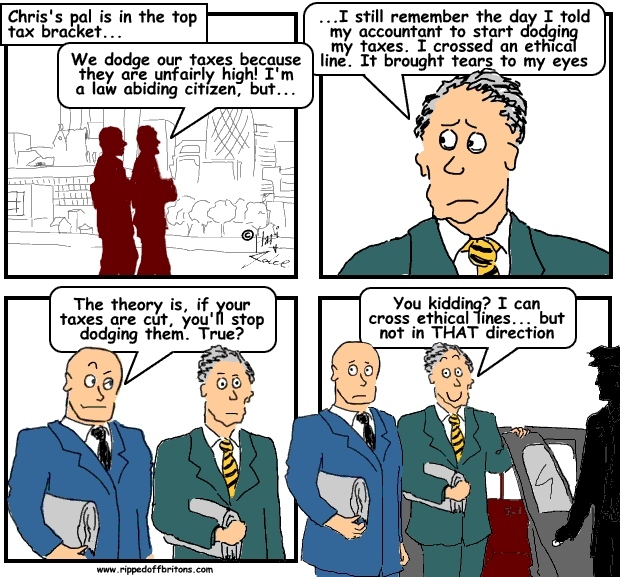 Tax avoidance is an act between consenting adults: the avoider, and the taxman. The avoider breaks no laws only doing what the taxman does not disallow. “He didn’t say no” is the cast-iron defence accepted in the highest courts in the land. The avoider moves through the loopholes and the lacunae left, some meticulously and some incompetently, by Her Majesty’s Revenue and Customs. In the words of St.Paul (Romans 4.15) “where no law is, there is no transgression”. I have concluded that introducing a broad spectrum general anti avoidance rule would not be beneficial for the UK tax system. This would carry a real risk of undermining the ability of business and individuals to carry out sensible and responsible tax planning. Such tax planning is an entirely appropriate response to the complexities of a tax system such as the UK’s. The Treasury report, written by a leading “very clever, creative and talented” tax lawyer, instead suggests a “moderate rule which does not apply to responsible tax planning” – less GAAR, more MAARNARTP (Moderate Anti-Abuse Rule Not Applying To Responsible Tax Planning). Perhaps an unsurprising conclusion, as tax lawyers supporting GAAR have echoes of turkeys voting for Christmas. 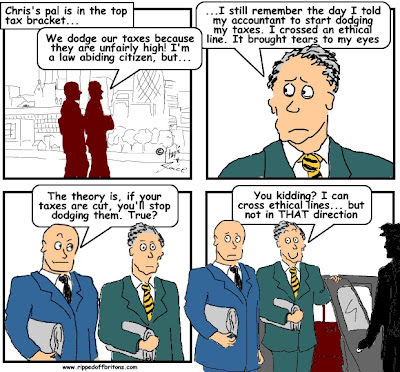 The reality is HMRC does not attempt nor intend to shut tax loopholes. It aims to keep them narrow and exclusive. The lower tax rates and supplementary allowances for dividends and capital gains were supposed to be the preserve of the asset owning classes – owners of property and shares. They aren’t really meant for ordinary people who purely depend on their own labour for their livings. The good reason: to encourage wealthy investors to back companies whose shares aren’t listed on a stock exchange. The real reason: 30% income tax credit on the investment buying shares in the trust; no income tax on dividends paid by the trust; no capital gains tax on gains made selling trust shares. The extent to which HMRC acquiesces to tax avoidance can be specified mathematically using the “Taxable Income Elasticity” (TIE) scale. TIE is a measure of the degree to which taxpayers will mould, squeeze and reconstitute their income to reduce their tax, (the percent change in reported income when the net-of-tax rate increases by 1%). In the normal course of events all this elastic tax avoidance bounces along inconspicuously, with the wealthiest habitually getting away with paying tax at a rate lower than their cleaners. However, with the introduction of the 50% tax rate, the wealthy did a synchronised bounce. £16 billion of income, according to the Office of Budget Responsibility, disappeared from the 2010-11 tax year (50% top rate tax) and bounced into the 2009-10 tax year (40% top rate tax). This allowed the Chancellor to claim that the 50% rate had failed to collect much additional revenue, making it not worthwhile keeping. When setting the 50% rate, the treasury assumed the wealthiest had a TIE of 0.35. They greatly underestimated the instinct of those who can to dodge tax. Academic studies quoted by the Treasury estimate high earners with TIE of 0.46, going up to 0.7 for the chancers. In contrast those in more ordinary circumstances show a TIE of around 0.1. The Laffer Curve, from the HMRC report, predicts how much tax will be dodged as the income tax rate is increased. As the rate increases so long as taxpayer behaviour is unchanged more tax money will be collected. However, in practice as the rate goes up the pips start squeaking: tax avoidance, tax evasion, and just plain slacking kick in to reduce the amount of income declared and tax collected. So what kind of people are these high earners? HMRC’s report on the effect of the 50% rate shows the breakdown. 50% are in the “Financial intermediation” and “Business Services” industries – i.e. bankers, lawyers, and accountants. Some of our nation's most elastic professions. In the graph below, by the Institute of Fiscal Studies, the purple line shows what actually happened when the 50% rate was announced. The green line shows what would have happened if avoidance of the 50% tax rate had not occurred. The jump in 2009-10 income followed by the drop in 2010-11 income shows the billions of income bounced into the earlier year to avoid the 50% tax. With the abolition of the 50% rate from April 2013 announced in the March 2012 budget, there will doubtless be another bounce as income is deferred until the tax rate is dropped. Thus passed the 50% rate. Conceived by the last Labour government in a moment of last minute mischief, always vulnerable, and still in its infancy horribly strangled by elasticity before it could show its true potential. Yet in its short life the 50% rate burned brightly enough to shine a light on just how dodgy top income earners are. But does it matter? Is it just envy? Individual examples of excellence are used to justify high pay for mediocrity and failure. But the objection is not even about unjustified rewards. In spite of the country getting richer, figures from the Office of Budget Responsibility show the share of the wealth going to ordinary Britons is reducing, with the share going to the wealthiest continuing to soar. (In the graph the Gross Value Added is what the nation makes in goods and services. The Labour Share is the proportion of the profits given to the people doing the work). The government aims to push wages down further by using regional public sector pay deals, reducing the wage competition faced by private sector employers and allowing them in turn to push down private sector salaries. With the ordinary Briton’s share reducing, they have to work longer to have adequate pensions: by working until you are older you can save longer into the pension, and will have less time to live on that pension. Reduce the encouragement for executives to rip us off by limiting their gains. Control the wages going to top executives, as it has become evident the top executives won’t control this themselves, and shareholders are casually ignored (even if those shareholders hold 82%, as the government does in the Royal Bank of Scotland). With the Labour Share dropping, taxes to pay for education, health, law & order, defence, pensions etc. have to come from somewhere. Apologists claim that the top 1% already contribute more than 25% of income taxes. The steady growth in their contribution since 1990 is not a result of increases in income tax rates, nor a reflection of their elastic generosity. It represents the uncontrolled concentration of national income in their hands. "The chancellor has said he is "shocked" that some of the UK's richest people have organised their finances so that they pay virtually no income tax." If that is so, why not have a tough GAAR anti tax dodging law? "The danger is that the existence of a GAAR introduced with this stated principle will encourage the view that any arrangement not caught by the ‘narrow’ GAAR is responsible tax planning. In other words it will, in the minds of taxpayers and planners, push the centre ground towards the right, and thus encourage more, not less, activity in the area of the spectrum that is avoidance." Some excellent analysis in here, tinged slightly by the use of childish name-calling. My opinion differs from yours, perhaps, but if you call me 'an apologist' and I call you a 'Commie', we're not further forward, are we? The polarisation of politics in the UK is as dangerous, if not more so, than questionable tax strategies. Bring in laws to drive away the rich and hard working. They get far more money than those on the dole. Rich people just make everything in our country more expensive than it should be. That's unfair. They should be extradited to Switzerland where they can live amongst their fellow multi-millionaires who all work 45 hours a week and have to pay 200 quid to visit a doctor and 5 quid for a cup of coffee. That'll stop them bidding up our house prices and taking over-priced parking places with their BMWs. Clearing out the rich will cause a recession, but that's no problem if you are on the dole or a government employee. You get paid the same anyway for doing nothing. The real advantage of a recession is that it causes prices to fall. If you have no job, or if you're poor, that's got to be a good thing. Who can afford to live in Central London? Answer: Only the rich. If we get rid of them, property prices throughout the country will fall, but mostly in Central London. As the rich move out, the poor will once again be able to live in the heart of London. "For great tax data from HMRC, see: http://www.hmrc.gov.uk/stats/income_distribution/menu-by-year.htm#33"
Now goes to a page that says the information has been archived. I can't find it in the archive. Do you know where it is?